Standard NDCA for BUYER Customers/Clients interested in investigating a property. This document is legally binding and assists all parties in building and maintaining a mutual trust relationship as the initial investigation moves forward toward full disclosure. Preparation for transition with a full transition of the property and associated business will occur in a timely and reasonable process that enables the Buyer to prepare for full ownership and the Seller to make full transition for Buyer's success and Seller's satisfaction. 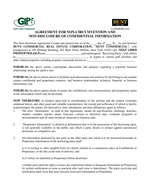 This document binds the Buyer/Investor, all Principals, and all associates involved with any purchase proposed including but not limited to: Attorney(s), CPA/Accountants, Financial Planners etc. This document does not expire.